Ah, the jukebox musical. Sure, it’s cool to give them flack, what with their often-flimsy books and aims to please. Yes, there is something inherently disheartening about a jukebox musical, but let’s be real: one doesn’t go to this kind of show looking to be punched in the conscience. Broadway’s latest romp through the American Songbook, Baby It’s You!, isn’t exactly one for the books, but it’s not the worst time you’ll have on Broadway this season, thanks to a company that delivers on its memorable music. In between roll calls of major pop culture icons, the new musical centers on Florence Greenberg, the New Jersey housewife-turned-music mogul who discovered onetime girl group The Shirelles. Baby loses steam with its one-two punch of a slight book (by Floyd Mutrux and Colin Escott), mishandled by directors Mutrux and Sheldon Epps. The show makes exuberant sense in its performance and recording session scenes, but most songs come out of nowhere, or worse, are shoehorned into the dialogue. The Shirelles’ preoccupation with matters of the heart lends some sense to a romantic subplot, but more often than not, it’s a bit of a stretch to turn a pop song into a revealing character number. It’s sort of a pity—Baby It’s You! tells a “story [most of us] never knew,” but in Escott, Mutrux, and Epps’ hands, the story fizzles when it should pop. Don’t blame this one on the company. This is a talented cast, and they’re selling what they’ve been given. Their relative youthfulness does a world of good, imbuing even the most hackneyed scenes with an unexpected charm. Tony Award-winner Beth Leavel’s Florence Greenberg is the pre-Motown Mama Rose, a warmhearted steamroller in fabulous shoes. 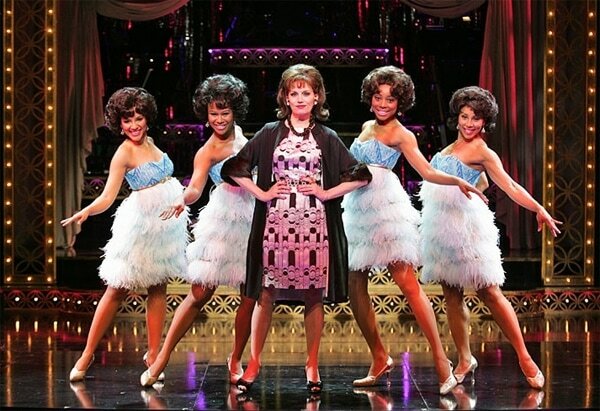 Ms. Leavel’s presence is a welcome one, but it is the quartet of Christina Sajous, Kyra Da Costa, Crystal Starr Knighton, and Erica Ash as the Shirelles that grounds this production when it needs it most. No diva drama here: these girls maintain a sense of easy, fun camaraderie all the way through. It’s clear that the showiest details of this production got all of the attention, while its foundations—the book, the story, the staging—were allowed to be adequate. To be fair, the arrangements (Rahn Coleman), orchestrations (Don Sebesky) and vocals of classic songs are uniformly good. They are sometimes even spectacular, thanks to Ms. Knighton, who appears to be having the best time ever. But since we’re talking icons, forgive me for saying that, well, there’s often not much “there” there. That’s the thing though; Baby isn’t about the foundations. It’s about the catalog. It’s pleasant enough, palatable enough, and an occasional toe-tapper, but in the end, the real disappointment is not found in watching the stars fade. It’s more from the expectation that this bubble of a musical would remain afloat on the nostalgia of growing up with songs like “Mama Said,” “He’s So Fine,” and the oft-reprised “Dedicated to the One I Love.” And if you know what you’re getting into, you might enjoy it. You may very well enjoy it in spite of yourself. You may not want to clap along. You may not want to sing along. But you might. And that’s okay. E. Meredith Young is a freelance editor and writer based in New York City. She is an alumna of James Madison University, where she began an unabashedly nerdy love affair with dramaturgy, culminating in a Kennedy Center ACTF nomination for her work on Lorca's Blood Wedding. In her native Virginia, her work has been featured in VEER Magazine, the Hampton Roads Shakespeare Festival, and at the state's International Thespian Society Festival, sponsored by the Educational Theatre Association.